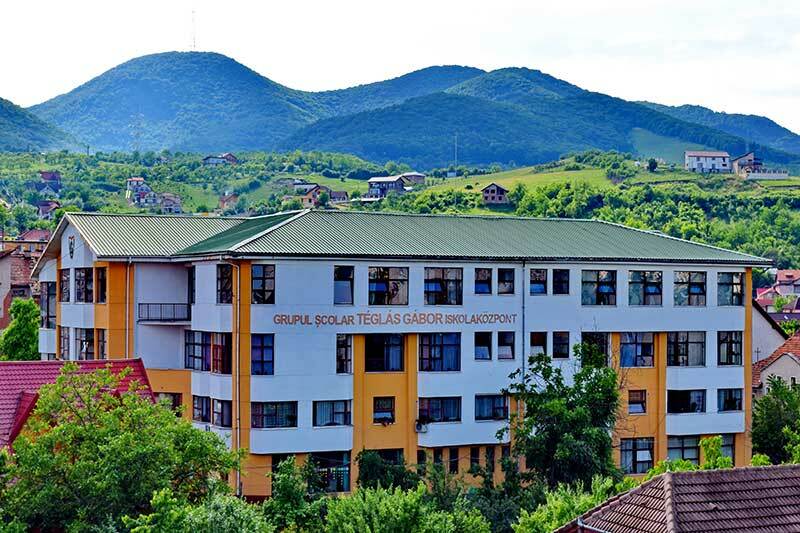 "Téglas Gábor" Theoretical High School is one of the youngest and most modern schools in Ardeal. Our school, a four-floored building, gives our young learners all the necessary conditions to learn. During the past 5 years we have incessantly tried to develop both our material and intelectual resources. We would like to thank everybody that contributed to the development of our school especially to those who helped us with the boarding school, with fencing the school's sports ground and also helped us to finish our project of putting automatically functioning shades for the assembly hall. We would like to mention that COMMUNITAS Foundation and Bethlen Gábor Foundation are among our most important sustainers. The Parent's Commettee also had an important role in the development and renovation of "Téglas Gábor" high school. Due to their help the main groundfloor entrance of the high school was renovated and embellished. Koppándi-Beczédi Ildikó from Deva, an expert in fine arts, made symbolical drawings from the Hungarian folklore. This place was created for multiple purposes , for example to be useful not only in day-to-day activities but also for celebrations. We have already celebrated the Hungarian Culture Days here and on other occasions the place had been turned into a fine art gallery to everyone's delight. In a POSDRU programme, financed by The European Union, a new culinary lab was founded on the third floor of our building - where the students preparing in this field are. One of our problems of foremost importance is commuting, as "Téglas Gábor" is opened for pupils from the entire district of Hunedoara. In the past 5 years we have succeeeded in partially financing the children who commute from Cristur and Hunedoara to Deva. Moreover, we managed to solve the transportation issue of the kids from Szent Ferenc Foundation to our school. In the future we would like to continue offering high quality teaching and services in order to contribute to the further development of "Téglas Gábor" Theoretical High School.